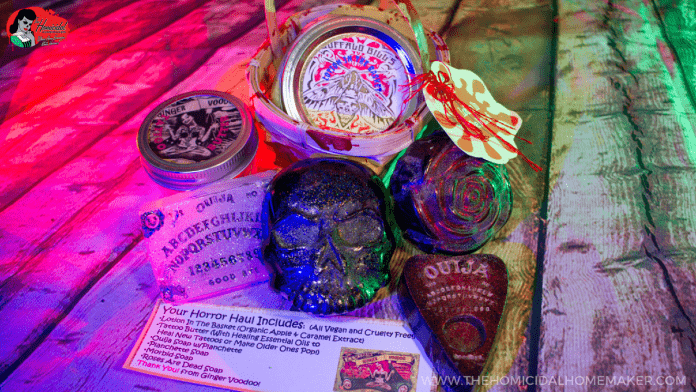 Ginger Voodoo – Horror Bath Products to DIE For! Make bath time spooktacular with handmade horror-themed soaps, lotions, and scrubs from Ginger Voodoo. Made with nourishing organic ingredients, that are vegan-friendly & cruelty-free. 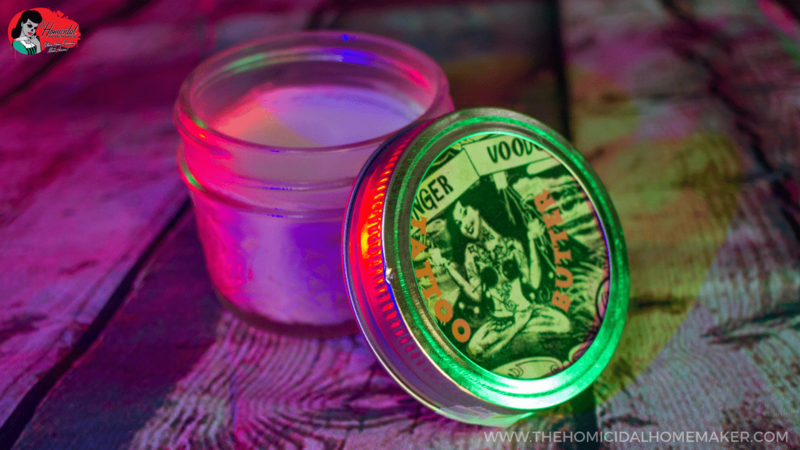 Scare-Up Your Soap Suds with Ginger Voodoo! It shouldn’t come as a surprise that I love unique, horror-inspired products. From my kitchen utensils, to my everyday decor, I love all things spooky. But I don’t think the spookiness should stop there – I think one should embrace a creepy factor in all facets of life, including bath time. There’s nothing quite like drawing a hot bath (or shower) to undo the stresses of the day. And I’ve discovered just the shop to make bath time spooktacular with horror-themed soaps, scrubs, lotions, and body sprays: Ginger Voodoo. This mother-daughter team makes their handmade products with nourishing organic ingredients, that are vegan-friendly and cruelty-free. I mean…seriously. Caramel Apple scented LOTION IN THE BASKET with an adorable miniature bloody axe inside. Would you use this lotion? I’d use this lotion…so hard. Buffalo Bill and The Homicidal Homemaker approve! This Tattoo Butter boasts big moisture in small quantities – you only need just a tiny layer to help reduce scabs and speed up healing. Because of this, one jar will definitely last a long time. I suppose it’s important for me to mention that I actually don’t have any tattoos, but that didn’t stop me from giving this Tattoo Butter a try. It worked great for moisturizing, as well as speeding up the healing process and reducing inflammation on any scrapes, cuts, and mosquito bites. It also feels lovely on elbows, knees, and heels – you know, all those places where one tends to get dry or cracked skin. I even massaged some into my cuticles for a little extra TLC. 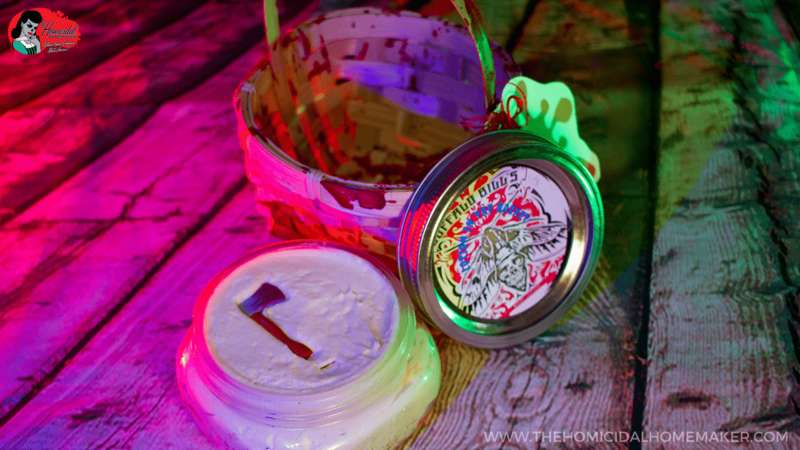 Unlike similar products and salves, this Tattoo Butter does not leave behind a greasy residue, or overwhelming scent. Being that I have extremely sensitive, fair skin, I am limited on the types of beauty and bath products that I am able to use. So it is very important for me to note that my sensitive skin did not have any negative reactions to the all-natural and organic ingredients used in Ginger Voodoo’s soaps. All of the soaps featured a luxurious foam, and relaxing fragrances to clear your mind and help melt away stress. And if you need further convincing, just look at the soaps – they’re gorgeously crafted, and would make a very welcome addition to gifts for family and friends (but let’s be honest…you know you’ll end up keeping them all for yourself!). Have you tried Ginger Voodoo? What are some of your favorite products? 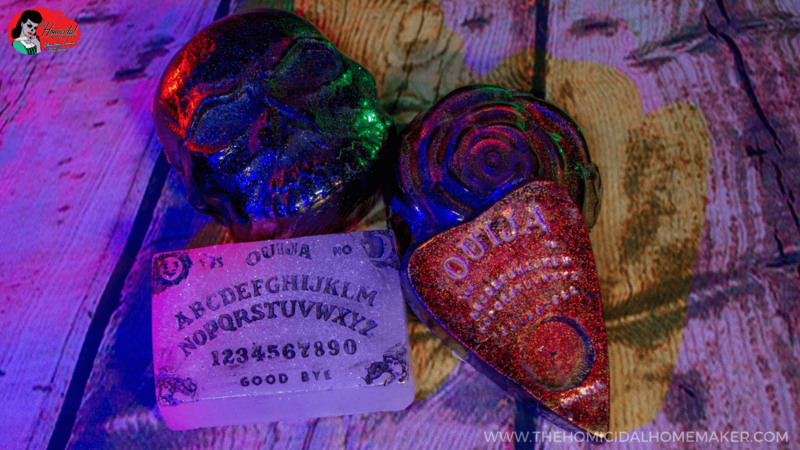 I am already planning to pick up a few more soaps and some of the new products on the Ginger Voodoo site, such as their “The Blob” jelly soap or “All Out of Bubblegum” Body Butter, and some of their delectable exfoliating lip scrubs. 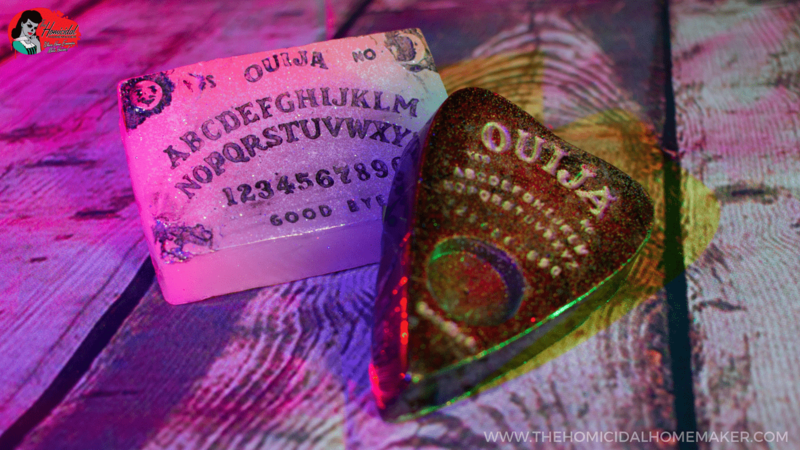 Previous articleTwilight Zone Mystic Seer Candy Box Printable for #TwilightZoneDay!